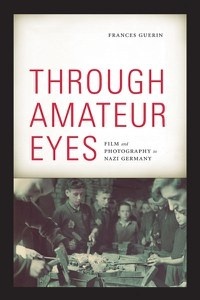 In her previous two books Frances Guerin looked at the German cinema of the 1920s and, with co-editor Roger Hallas, the role of visual culture in bearing witness to historical trauma. In this new study she looks at photographs and films produced by German soldiers and civilians during World War II, suspending the common assumption that these images were taken by “perpetrators” who blindly accepted racist ideology. She also rejects the idea that to look at such images automatically implies adopting the position of the Nazi as viewer. Instead she approaches the images as documents allowing multiple perspectives. Her particular case studies include photographs taken on the Eastern Front by German soldiers, color photographs of the Lodz Ghetto, color film footage of the war, and images from Eva Braun’s home movies and photo albums. Guerin’s analyses develop some useful tools for “historicizing and complicating”(285) archival images. By “exploring the intertextual and intercultural relationships”(8) of the images, Guerin seeks to open up a new conceptual space in which we can bear witness to history. When we look at these images we run the dangers of either replicating a Nazi gaze or normalizing historical trauma. A “denser, more nuanced understanding”(xiv) of the image potentially challenges the hold of ideology over the past. The amateur image reveals a series of tensions between professional and amateur, everyday and extraordinary, private and public. These tensions are manifest in formal features: “amateur images typically show events in longshot, in the distance”(23) and also include “mistakes, repetitions, out-of-focus blurs, underexposure, and overexposure”(24). Aging, fading, stains, tears, and creases also distance the image in time. Guerin proposes that these distancing effects allow the viewer to insert him/herself into new relations with the image. The anonymous or generic quality of the amateur image also removes the presence of the image-maker as author and potentially opens us more directly to those present in the image. Chapter Two explains how many German soldiers took thousands of photographs documenting daily life on the Eastern Front. Many of these were sent to families at home. Included among these photographs were records of massacres, executions and atrocities. Some of these images were confiscated by the Allies as evidence of war crimes. These images are now commonly seen as evidence of the complicity of the photographer in the Final Solution. But these images transgressed the official military prohibition against recording such “excesses.” In this way the amateur photographer potentially challenged the official version of events. Guerin also considers how photography from the period participates in aesthetic and archival features of industrial modernity. War, like mass tourism, was part of the increased mobility of modern life and photography provided mementos of new experiences and places. Guerin acknowledges that the images failed to witness human suffering. Today’s viewer is supposed to see the image differently, identifying with the trauma of the victims. The atrocity photographs were surely rightfully removed from their individual owners to become evidence of war crimes. But to rediscover that they were part of a more complex culture of image production does not necessarily tell us anything new about Nazism or the Holocaust. Guerin chooses not to pursue theories, such as those of Foucault or Bauman, that emphasize the continuities between industrial modernity and Nazism – although these thinkers would not deny the existence of the ambiguities that she attends to. Chapter Three considers the color photographs of the Lodz Ghetto taken by Walter Genewein, whose recording of the details of everyday life in the ghetto appears to locate him in the tradition of social documentary. His images inadvertently bear witness to the distinctiveness of Jewish culture. Yet Guerin herself reads these archival films from the Nazi period with reference to the more general practices of ethnographic film. The Jews were depicted in ways comparable to images of indigenous populations in the colonies of Africa, Asia and the Pacific. The final chapter discusses the photographs and home movies produced by Hitler’s mistress Eva Braun. These documents contain a unique mix of private experience with glimpses of public figures, creating “a historical consciousness that, at one and the same time, undermines and is undermined by the familial gaze”(220). Braun, “the childless photographer and filmmaker”(232), contradicts the Nazi stereotype of the woman as domestic nurturer. Watching these films, comments Guerin, the viewer indulges in private memory but also experiences “the simultaneous jolt into a historical recognition of the past”(251). But what exactly are we witnessing, if not evidence of a crime? Guerin claims that the memory of these events “remains a pressing concern”(286) but she never explains exactly what this might mean for specific individuals or groups. Without such considerations trauma serves as an unquestioned universal. Why should it surprise us that under Nazism people also had private lives and participated in the cultural transformations of modernity? It is not clear how the forms of witnessing advocated by Guerin lead to ethical responsibility except in the most generalized sense. No ideology can completely saturate the meanings to be found in a media text, but Guerin runs the danger of reading the Holocaust according to the cultural studies truism that all texts are multiple and contradictory. Subtlety of reading archival images needs to be justified by useful historical insights.